Plans for merchanidize have been given up. There may be some Give-Aways (brochures). Mouse Pad x EUR tbd tbd what is a fair price? We have to define how many units of each we have produced and define a reasonable price. We could ask someone who already sells CDs and T-Shirts to give us some - and we return those that have not been sold. Showing something and let people touch. We need permanently 2 persons to keep some eyes at the booth. We should have some Cocoa and Objective-C training books. If you plan to join us, please let us know here in the wiki (or send a mail to nicolas [at] roard com, I will add you). Knowing how many people will attend will help in organizing the event, and will encourage other people to join. There's usually a saturday dinner too. If you don't have write access on the wiki and you want it, you need to create an account and send a mail with your user name to webmasters [AT] gnustep.org to request it. We should have teams of 2 plus one volunteer for fall-back if someone can't attend at all. And, please be there! Sa. Feb 24, 2007 14:00 - 16:00 N.N. N.N. N.N. 16:00 - 18:00 N.N. N.N. N.N. Su. Feb 25, 2007 09:00 - 10:00 N.N. 10:00 - 12:00 N.N. N.N. N.N. 12:00 - 14:00 N.N. N.N. N.N. 14:00 - 16:00 N.N. N.N. N.N. 16:00 - 18:00 Oliver Langer, Helge Hess Developer Workshop: What to do with 3rd Party Solutions within the GNUstep Community? The goal of this workshop is to discuss questions dealing with 3rd party solutions and GNUstep and to summarize the results. At the beginning we may identify projects which seem to reinvent the wheel. Such projects are those implementing add-ons which have been developed before – logging functionality is a good example for this. Also, we may focus projects (re-) implementing GNUstep base functionality, like e.g. mySTEP. Then, having these projects figured out we may elaborate the potential reasons behind. By starting to identify reasons for “duplicating” code we may shift the discussion to a different perspective and ask ourself, what GNUstep brings to the application programmer? Especially we may work out the requirements of the “typical” GNUstep application programmer. Collecting all information, thus bringing the potential reasons for “duplicated” codes, plus the capabilities of and the requirements for GNUstep altogether, we may then find out approaches for the handling of 3rd party solutions within the GNUstep community. Since this session is meant as a workshop, the abstract presented hereby should be regarded as a collection of hints and all developers are warmly invited to actively participate in the discussion. The session will be moderated and organized by Helge Hess and Oliver Langer. Comparison with other semistructured database systems, with Coredata etc. 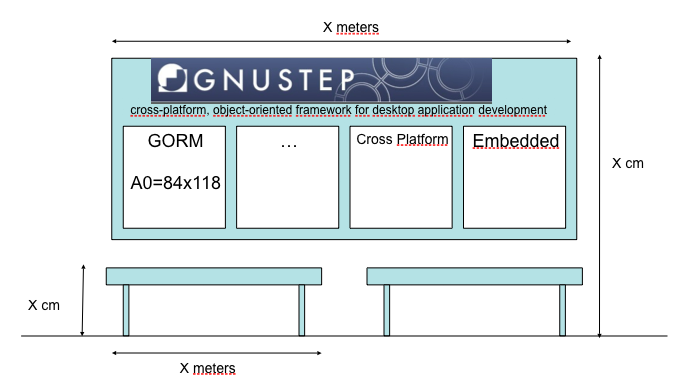 why does one want to run GNUstep on embededed devices? what is different on embedded devices? what is needed to develop applications for embedded devices? why is it currently run as a separate project (mySTEP)? How to secure valuable devices? - there is a hardware equipment insurance by FOSDEM - BUT ON REGISTRATION ONLY! Perhaps some GNUstep merchandise, like GNUstep T-shirts, GNUstep mouse pads, GNUstep stickers, etc. Though I'm not sure we could easily afford these yet. Quickly lurking through the Internet, I calculated that 20 T-shirts come to around 60 EUR, 30 T-shirts to ~85 EUR, and 50 T-shirts around ~130 EUR. This page was last modified 21:16, 8 March 2009. This page has been accessed 441,307 times.